Do you ever wonder how you can help a good cause. Lots of us want to do something. Often we don’t know where or how to start. Well, we found a few ways to make giving easy, fulfilling, and a part of your regular activities. It’s easy! 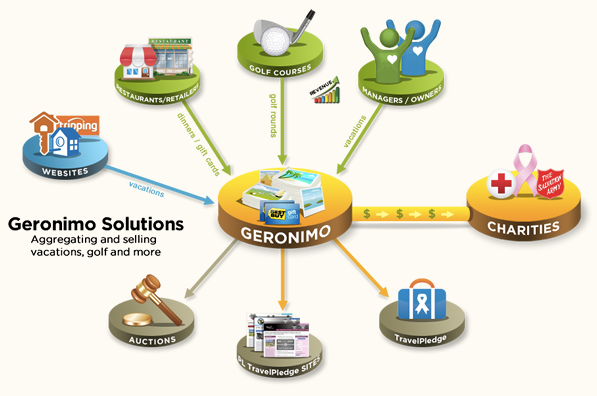 For example, here at Geronimo we have collected some incredible vacation rental inventory from around the world so that you, the traveler, can get a great deal on a great vacation and help raise money for a great cause. From our website you can simply select your favorite charity when you’re booking your reservation. Half the rent, if not more, will go to the charity of your choice. If a vacation isn’t in the plans for this year you can also play golf and still help give. We have a solution that automates everything. Participating courses are automatically promoted at fundraising events and on private label fundraising websites. There are so many more ways to find an opportunity to do good. Soon, we’ll be adding restaurant certificates. But we aren’t the only ones finding ways to infuse fundraising into everyone’s lives. If you are buying or selling your full time residence or a vacation home Brokers for Charity gives a donation to the nonprofit organization of your choice when your real estate transaction closes. The opportunities are endless when it comes to giving. Do good for yourself and someone else all at the same time.